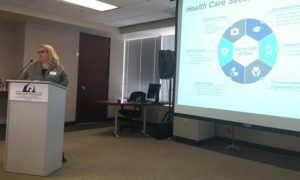 University of Phoenix® College of Health Professions and the School of Advanced Studies recently presented key findings about the health care industry in the Greater Phoenix area. University of Phoenix College of Health Professions Executive Dean Doris Savron presents whitepaper findings during forum to the Greater Phoenix Chamber of Commerce. Commissioned by the Greater Phoenix Chamber of Commerce, the whitepaper includes original research about Greater Phoenix region health care, including an industry snapshot, in-demand jobs and skills and a look at how the industry may evolve during the next 5-10 years. “Health care has been a driving factor for Greater Phoenix job growth in recent years, and the region has the potential to become a national health care hub,” said Doris Savron, executive dean for the College of Health Professions at University of Phoenix. The whitepaper, which supports the Chamber’s Phoenix Forward collaborative economic development initiative and the Greater Phoenix Chamber Foundation’s Health Care Workforce Collaborative, features a deep dive into the health care sector, including definitions, history, background, areas of opportunity and the chief forces changing the health care landscape. Understanding these changes and responding to them accordingly are vital to preparing the Greater Phoenix region for growth and innovation in this industry. Fostering a properly skilled and trained workforce is key to these efforts. The whitepaper highlights the needs of the health care industry and asks employers, educators, businesses and government officials to collaborate to build the talent pipeline needed to feed this growing sector. To view all findings, access the whitepaper at www.phoenixchamber.com/healthcareoverview. To learn more University of Phoenix, visit phoenix.edu.